The Brunson 545-190 Precision Sight Level is the standard of the industry. Brunson is still producing this level today, which cannot be said for K&E or Cubic Precision. 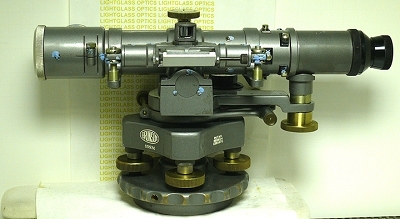 This level includes the Brunson 190 Optical Micrometer. Focus is from 2 inches to infinity, with an accuracy of .001" to 17ft, and one arc second to infinity- and beyond! This one has been fully refurbished to new condition by Brunson, and has fresh paint, new Calibration, all components checked and replaced if out of spec, new operators manual, illuminator and case! We feel it best to have Brunson calibrate instruments of their manufacture. The 545 will mount on all tripods and optical tooling mounts with a 3 1/2"-8 thread.